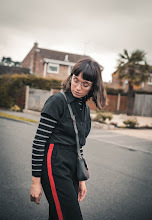 Continuing on from my obsession with space and its distant galaxies from a couple of outfit posts back in this post. This The Mountain tee is probably one of my favourites from the ones I've featured on the blog so far, although the Wolves tee comes close. I just adore the graphics and realistic details of the print, from the moon phases to the way the spacecraft has been superimposed on the milky way.